Well it has been just over a year since my last post which also marked my return from the land of sake and sushi. But just because I can no longer report on the intricately amazing Japanese culture from the perspective of a relative ‘local inhabitant’, it doesn’t mean that these petite feet, walking in petite shoes, did not carry me to other new and exciting settings. In this past year several other locations have been added to my otherwise humble portfolio, but this is something I will come back to at a later stage. At this particular moment I would like to make this post about my latest adventure, among the lush green hills of Provence and the glamorous, slightly sandy, promenade in Cannes. The South of France has been on our list of destinations for quite a while now but for one reason or another it hasn’t materialised until this year. And saying that everything was planned and booked last minute is an understatement but here we are, three hours before our ferry is due to depart Portsmouth, just about squeezing everything in our car booth. Now some people might ask why bother to drive such a long way instead of booking a comfy seat on a flight, like any normal people would do. This is because of two reasons really: 1. France offers an amazingly wide variety of very good, fresh produce and since we both dabble a little with cooking, we like to take advantage of this opportunity. But the majority of places do not offer a suitable variety and amount of pots and utensils, so some need to join us on our travels. 2. France produces arguably the best red wine on the planet and at fairly affordable prices, so it would be a shame to miss out on the opportunity to restock our wine rack(s) on our return. In any case, off we go and due to a combination of good luck and low traffic we manage to embark (literally) towards our new destination. Now, because of the late booking we were unable to secure a cabin, which would have been nice, considering it was an overnight crossing. However do not dismiss the reclining chairs which come and no extra cost and which with the help of a travel pillow and a gigantic shawl can become quite comfortable. But also, I’ll let you in on a little secret; on these kind of ships they normally have a soft play area, which is cordoned off for the night crossing. And if you very cleverly prepared some accessorise in advance, this area can turn into a rather comfy location for the duration of the journey. Or so I’m told as I didn’t become aware of this until the following morning, but am ready to give it a go next time. At any rate, we arrived on French soil in good time and the driving was quite uneventful. Motorway driving in France does not appear too complicated (can only report from a passenger’s seat) and as long as you get to grips with their toll paying system everything else runs quite smoothly. 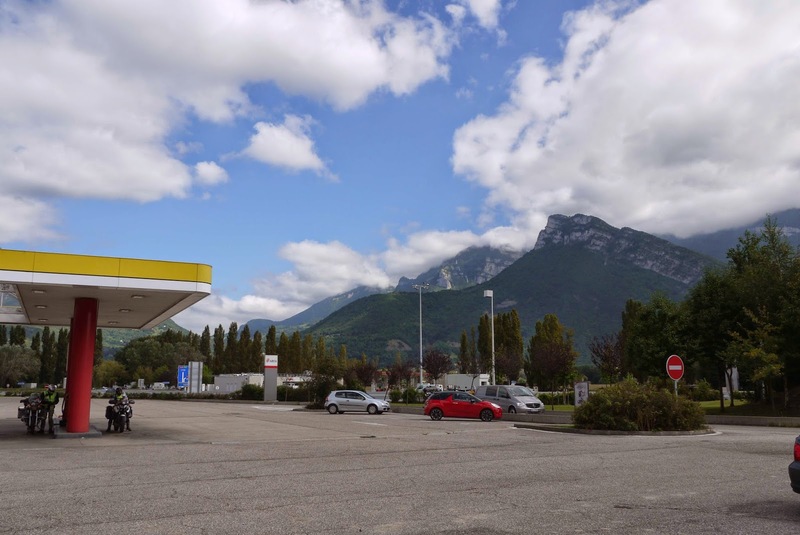 There are plenty of services along the motorways and ‘Aires’ (stopovers which may or may not have facilities, but which offer you the opportunity to stretch your legs). We already knew that it would have been a bit of a push to do the whole drive in one go, so we decided we will stop over night, when our bums were getting too numb from all the seating in the car. Unplanned at all, this happened when we reached Macon and to our surprise we found the exact same hotel (the Ibis, Macon Nord) we stayed in three years previously, when we drove around France. Although quite basic, it is clean and reasonable priced and very conveniently placed next to a restaurant/grill which normally caters to lorry drivers but which also serves one of the best ‘faux filet’ steaks I have tried. It did not disappoint three years ago and it still did not disappoint now (sorry no pictures to support my comment; still need to get to grips of carrying my camera everywhere). The second day of driving was even more exciting as we knew we were approaching our destination. 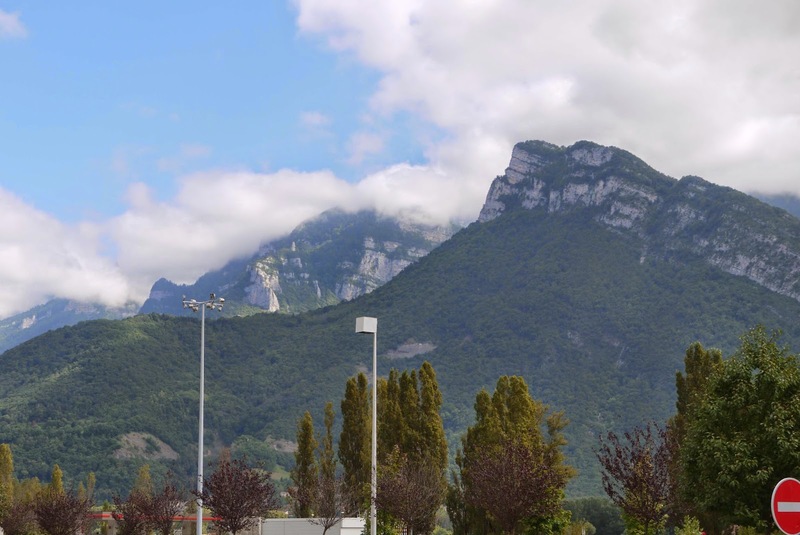 As we were getting closer to the French Alps the scenery was changing and even in a service station, lunch was a lot tastier with such a view to behold. We soon left the Autoroute and carried on the windy roads, leading us further in the heart of Provence and closer to Grasse, our targeted location. At long last we got there and were greeted by busy narrow streets, winding among tall town houses, thus wiping out the image we have formed in our minds of a little quaint French town (more about Grasse in a future post). Nevertheless our accommodation was fairly easy to locate (even with the one way system utilised in the town centre) and we and all our bags, pots and utensils were finally in the small flat which was to be our home for the next two weeks. However after two days of driving and with the majority of shops already closed on a Saturday evening we decide that going out in search of a restaurant was a much better decision that cooking our own dinner. So after a heavenly shower to wipe the road dust off and a quick change of clothes, off we went to explore our not so little local town. Now, in all our excitement we did not think in glancing over a local map and knowing that we were relatively central we thought it would be very easy to locate a few open café and restaurants, especially as it was the weekend. How wrong we were indeed! It only took a wrong turn to end up on narrow back streets with no other sign of life than the odd group of young guys hanging around corners. This caused a little bit of uneasiness for us, to say the least and the further we went the further those back roads seemed to entangle themselves. There was no sign of a café with small tables on the side walk or the sound of people enjoying a cocktail or two or a ‘vin rouge’ after dinner. It was Saturday night so where was everyone?!?! This is still a mystery that I haven’t resolved. Just when we kind of figured out the route back to our flat and accepted that our first dinner in Grasse will have to consist of leftover crackers and Werther’s Original, the faint sound of chatter and glass clinking reached our hungry ears. At this point we were so excited that we followed the sound without even caring that more groups of youngsters were springing out as it got darker. And then there it was! Just when we’ve given up we’ve found the one restaurant (in that area) which was still open. By this point we didn’t even care what sort of food they were serving as our stomachs felt like they shrank to the size of a walnut from all that hunger. As it turned out it was a rather well-to-do location called La Fleur-de-Lys (which as I later found out also appears in the Michelin guide), with a lovely menu using locally sourced produce and quite a decent wine list. Now some may say it was our hunger talking but I’d say our taste buds did not deteriorate that much; the food was absolutely delicious and although on the small side portion wise, it was plentiful. 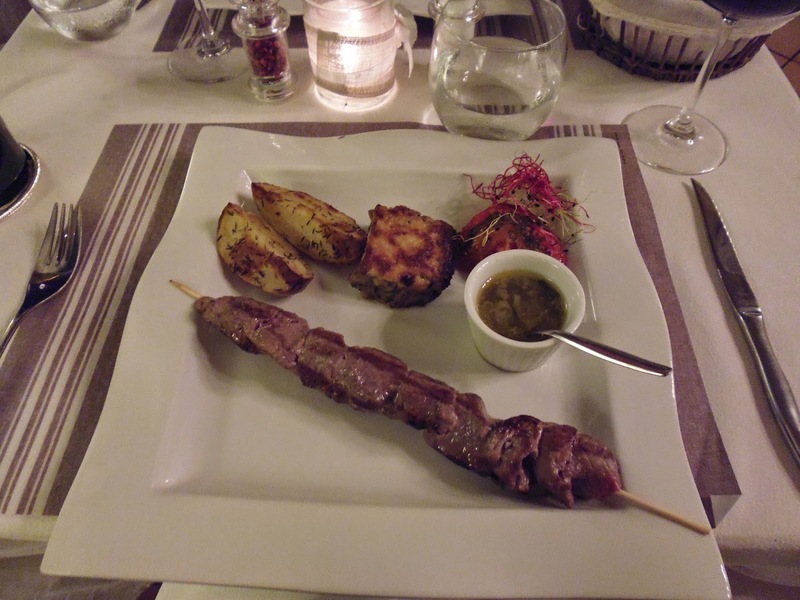 Lamb skewer with herb roast potatoes, potato gratin and a pesto type dip. 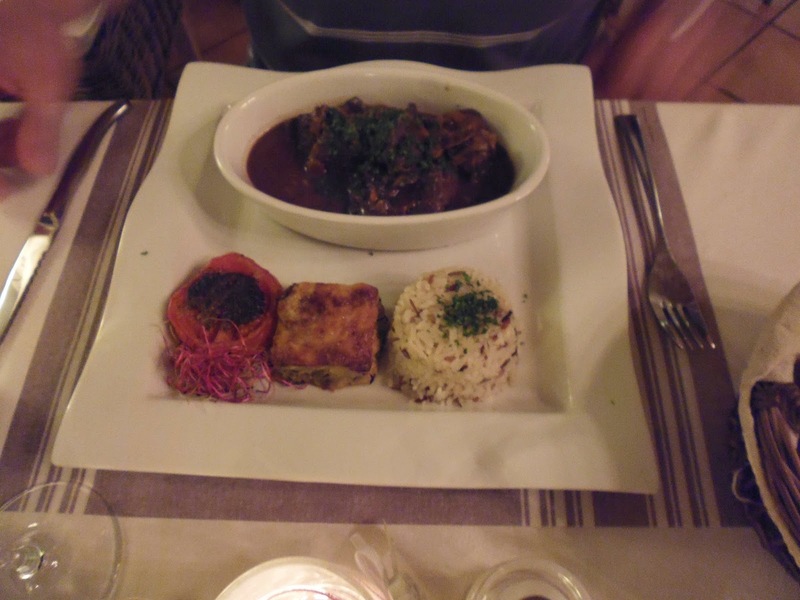 Beef Bourguignon (although they called it differently, that’s what it was) with wild rice, potato gratin and baked tomato. It was all delish and it went down very well with a house bottle of Cotes du Rhone. After we’ve feasted on what definitely beat the crackers and Werther’s Originals we had left, we returned to our flat which was only 2 minutes around the corner (told you we took the wrong turn right from the beginning).